There is something of the religious ritual in my wife’s preparation of rice. The grains are taken from a special wooden box that lives under the sink and placed into a colander. She inspects them carefully for any defects or stray material. With the water on, she rhythmically sifts the rice, cleaning each grain, washing away dust and impurity. Sometimes, she cooks rice in the electronic cooker, sometimes she makes it on the stovetop. Either way, when the rice is ready and the lid lifted, she always inhales that first steam with a smile of pure content, a hint of prayer in the corners of her mouth. I grew up with Uncle Ben’s Rice. It was one cup rice to two cups water – let it boil, then cover and turn down the heat. Sometimes my mom would drop a peeled clove of garlic in there. We ate it with black beans or as a side with stew-like or heavily sauced dishes. 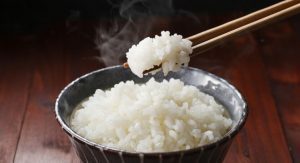 I didn’t think too much about rice, what it actually tasted like, what differentiated “good” or “bad” — it was, more or less, a starchy sponge that absorbed other flavors. Needless to say, my wife did not enjoy my rice. She had a look of horror when she watched my prepare it. My Uncle Ben’s was blasphemy to her — an insult to rice. At the same time, it took me a very very long while to understand her devotion to rice. Rice was rice for me. I just didn’t understand the aesthetics of it. It was like Opera music. I have no critical understanding of the form, therefore it all sounds the same to me. If we were gone on a trip somewhere, my wife would miss rice; when we were back, first thing would be to make rice. Carefully scooped out of the cooker, grains slowly separating, she would cherish that first bite, the initial moment that the chopsticks reached her mouth. The smell, the texture, the clarity of taste — her rice was telling her a vastly different story than what it was telling me. In the Shinto religion (the native, animist religion of Japan), each grain of rice contains the seven “lucky” Gods. Pretty crowded real estate. While it cements the sacred nature of rice in Japanese society, It is also a mystical version of your mom telling you to tell you to think of the starving kids in insert preferred famine-stuck country here when you left food on your plate. Bowls are scraped clean, chopsticks deftly gripping that last stray grain sticking to the side. I have learned to do it myself, using the sides of my chopsticks to corral the renegades, lifting the bowl to pluck the last bits as delicately as one of Darwin’s finches eating seeds. In fact, as soon I realized that I had become proficient at skilled rice ingestion, I realized that I had also gained an awareness of rice. I now can differentiate the textural differences, the subtle flavor variance between a bowl of home-cooked, high quality rice and that which comes out of a big steamer at a cheap udon restaurant. I appreciate much more fully how the slightly warmed, vinegar-licked rice is the real star of a great piece of sushi. Those seven Gods are finally speaking to me — more than once, I have caught myself, surprised myself actually, at my pleasure in eating plain rice. Not as a side dish, or with something else, but just the thing in itself. I am learning the language of Japan one grain at a time.